We celebrated Ed’s birthday in Florence. I never have seen the city so beautiful as on these last days of October. The light was transparent, lissome, kind to all. Our regular hotel, Tornabuoni Beacchi, gave us a large room overlooking the piazza below and a glimpse of the Trinità bridge over the Arno. We love the location of the hotel, its old world decor, friendly staff, and flowery roof garden. 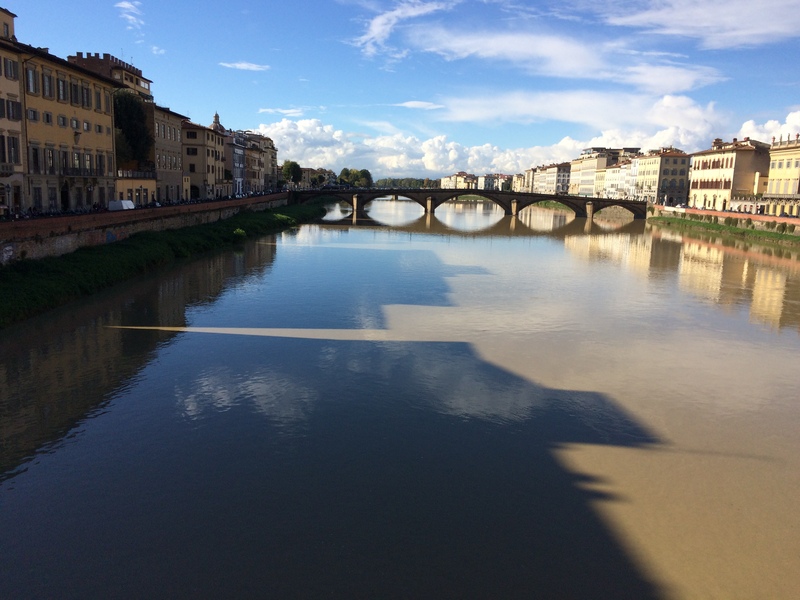 Walk out and you’re looking down onto the Arno in three minutes. Rivers are always changing color. In this view, the color reminded me of the porcini mushroom soup I had at lunch! But glassy and still enough for the shadows barely to ripple. Is this the most humane and pleasing city on earth? Maybe Seville is a rival, with its silvery river, flamenco, and scent of oranges, but Florence has the renaissance, a glowing light, and better food. Florence has always been the same. For years we went and Florence was Florence. Only the fashions changed, and the exhibits, or so it appeared to a foreigner. Now the city is just burgeoning with creative new places and with a new ambience due to banned cars in many parts of the city. Thank you, Renzi, former mayor of Florence and now prime minister of Italy. He made Florence an open walking city. A bicycle city! The only problem now is that you become so relaxed you can get mown down by a taxi or other allowed vehicle. The major improvement is Piazza San Lorenzo, which used to be so obscured by the leather market that you couldn’t see the church. Many other areas also are pedonale, walking only, a fine, fine improvement. The area around Santa Maria Novella, long a seedy section of the city, is changing by the day, with new shops, JK Place Hotel, and the open spaces all cleaned up. A grand change happened to Mercato Centrale, the old city market housed in a fanciful iron building that looks as if it were once a train station (but was not). The regular cheese, meat, fish market remains downstairs, and historic Nerbone is still serving the boiled beef panini with glasses of red wine. Upstairs, however, is now a food, as in foodie, emporium, very upscale and chic with long bars for coffees and snacks and, around the periphery, cool stands selling books, housewares, pizza, breads, confections, seafood, and even lampredotto for the intrepid. Lampredotto–made from the fourth stomach of the cow–is a florentine favorite. I thought it was tripe but it’s a specific stomach, and not made from the first three.There’s much info on line if you’re interested in the distinctions. Feltrinelli RED bookstore on Piazza Repubblica now has a ground level cafe. The chain also has opened a branch at the train station. I am happy! When your train is late, or you just need to grab a book, there it is, along with a bar selling interesting sandwiches, even arancini, the Sicilian rice balls stuffed with cheese or ragù. 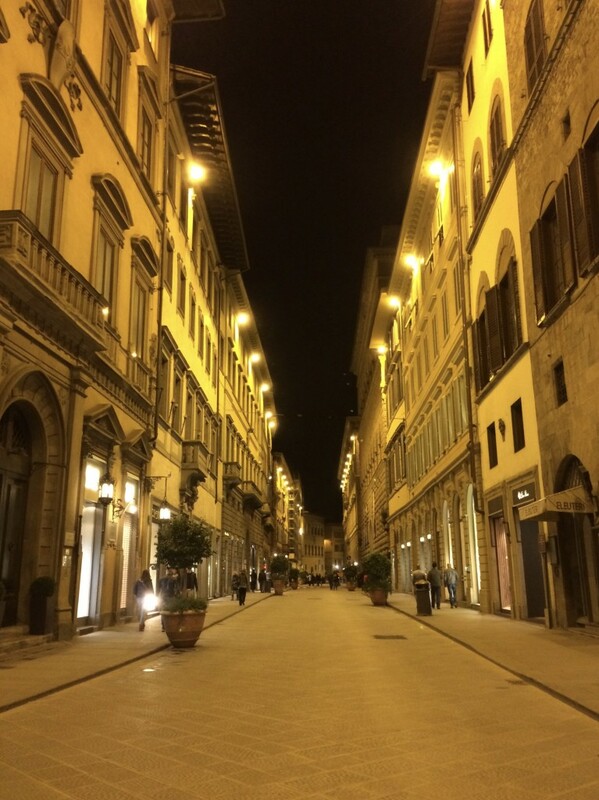 The historic cafes lining Piazza Repubblica have constructed outdoor enclosed seating with heat lamps. Fortunately all of them are identical so the look of the piazza is not discombobulated. We sat with friends as it got dark and still had the sense of being outside. New restaurants, shops, casual cafes, and wine bars are sprouting overnight. There’s a demise with this. 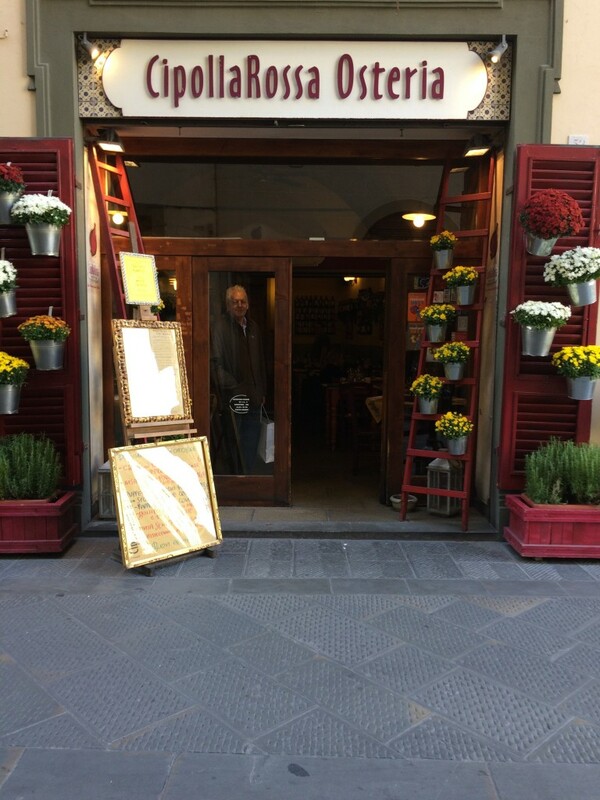 I will miss the lovely linen shop near the duomo and my stand-by nice paper and notebook shop, Tassoti. But the classic Ginori china shop has transformed, not disappeared. It is one of the most stunning retail renovations I’ve seen. 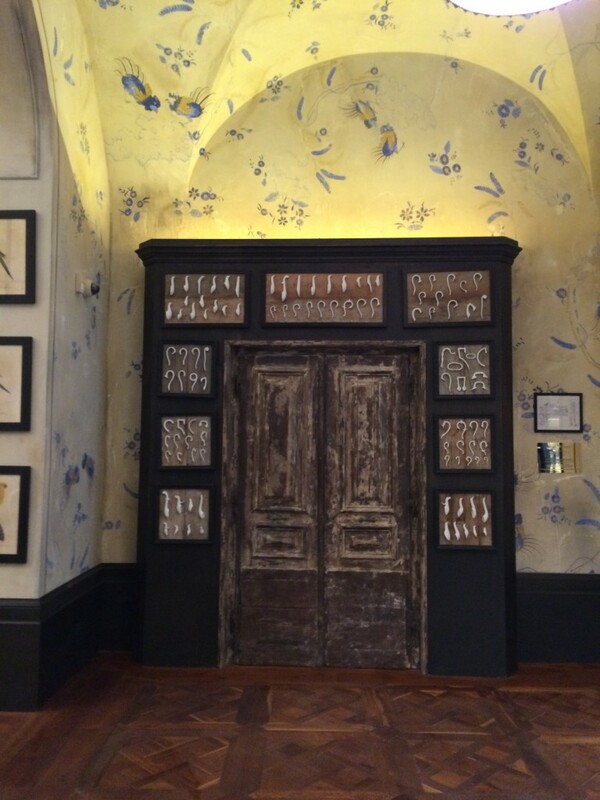 Those are fragments of old pitchers arranged around the door. The table settings all over the store seem like Edith Wharton should be pulling up a chair, and I’d like to sit beside her. Here’s a little study, where you could count up how many place settings you have! 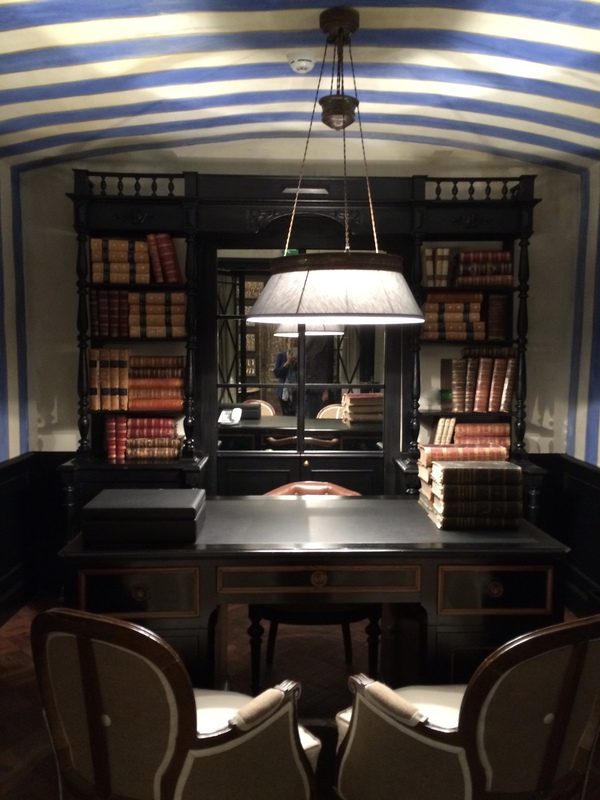 That striped blue ceiling–what a bold move when the walls are already striped too. 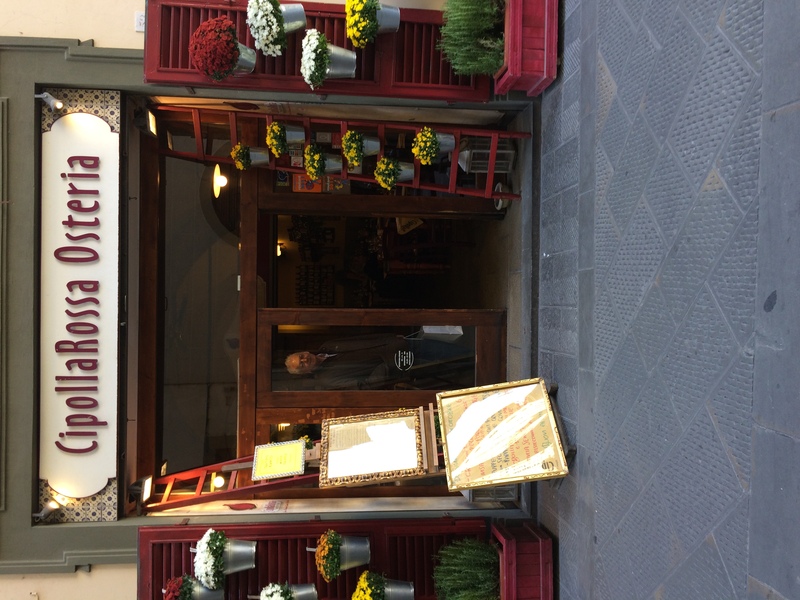 Florence is amazingly short on house and kitchen stores. This is a lovely exception. Now to the table! For more photos, go to the websites. I don’t mind taking quick photos of plates sometimes but I don’t like to roam the restaurants with my iPhone, even though I’d like to. We tried and liked very much Golden View, right on the river. The name put me off as it sounded like a million Chinese restaurants, but the white marble counters along the street displayed authentic looking fish and octopus, and there was the river, so in we went. Very contemporary decor with tons of art and near art on the walls, really nice service, quiet, and a good place to toast Ed attaining another year. At lunch, we stopped at a place we’ve often enjoyed, the café CipollaRosa, Red Onion. There I had the soup the color of the Arno, a rich broth with lots of porcini. Ed ordered spicy seafood pasta, followed by fresh, fresh salads. There is Ed in the window. Stop taking pictures, Frances! This is the kind of place we often choose for lunch. Good, fun, quick. Quick because there’s so much to SEE afterwards. Always, there’s an exhibit at Palazzo Strozzi that will take you somewhere you’ve never been before. 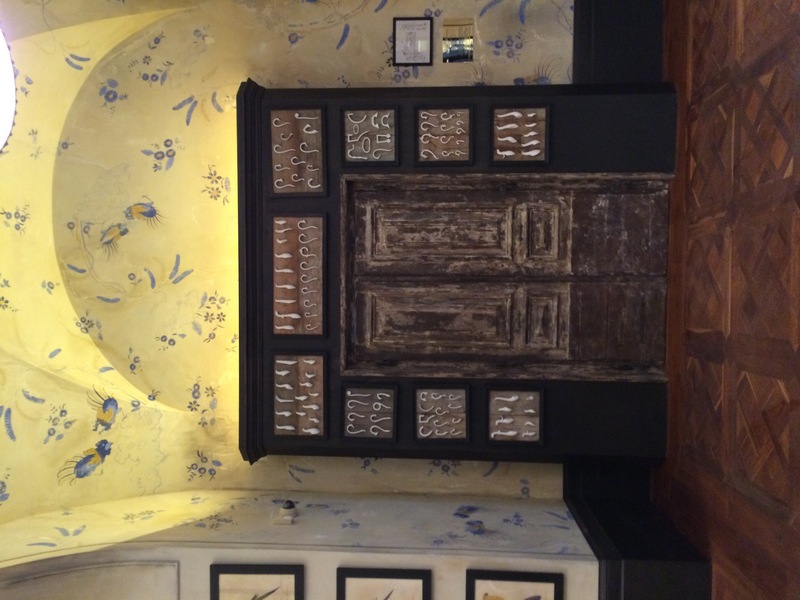 Florence’s new flying-high, concept restaurant charmed us and our friends who met there for midday pranzo : La Ménagère. It is somewhat of a menagerie, since the site offers a long coffee bar, kitchen items for sale, a gorgeous flower stall, and a restaurant that should be featured in Elle Decor. The space looks gutted and left to charming ruin. Multicolored orchids, roots dangling, hang low around the room and some of the light fixtures are made from disembodied arms of chandeliers. Hard to explain! It’s all very fun and different. So is the menu. Roasted gnocchi with cheese, lemon, green apple and fried cous cous. Cauliflower soup with sauce of almond, anchovies and mozzarella crumbs. A soft cheese mound with potato sauce, mustard, and spinach. Pasta with tripe, plums, capers, anchovies, parsley, almonds and ginger. WOW! Not the traditional Tuscan menu. 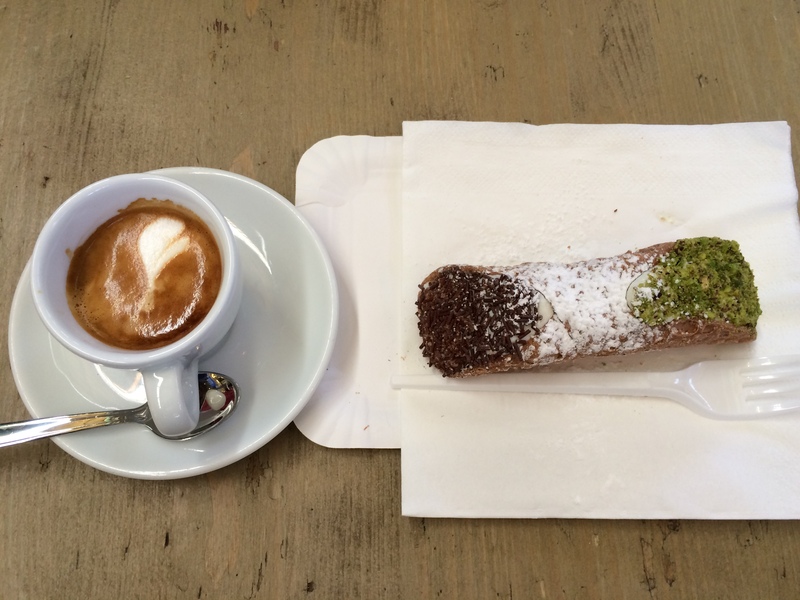 For our third lunch we chose Olio on Santo Spirito, so cozy and discreet. I would imagine lovers go there frequently, but there was a changing table in the bathroom so maybe it’s more for young mothers meeting friends. We were very late so had to ourselves the lovely room lined with wine, like a library but with bottles. I felt we should be confiding secrets so I asked Ed to tell me something he’s never told me before. I don’t know what I expected but it wasn’t that in fifth grade he had a crush on Sister Hedwiges, his teacher. We do love the traditional Tuscan food and no visit would be complete without a dinner at one of the great trattorie. A favorite is La Casalinga. We often go, as we did this time, to Camillo, right over the bridge. It’s crowded and the waiters like to joke. Who’s not happy with a plate of fried zucchini sticks to start, boned rabbit, roasted potatoes, and some most excellent Sirah from Cortona. Knowing we live in Cortona, the waiter, when we ordered our local wine, said we were “playing in the house,” an expression I really liked. Good food, great talk with friends, and a walk out into the quiet. The missing traffic! Magic. Walking home along Via Tornabuoni, we were in a golden city.